Make Music Nashville at Belmont University in Nashville, Tenn. June 21, 2017. As part of the global Make Music Day, Belmont participated in Make Music Nashville, an all-day, open-access celebration of music held all around the city on Wednesday, June 21. With a full schedule of events planned for the day, Belmont hosted community events and on-campus celebrations for faculty and staff, among other festivities. Dating back 35 years, the global Make Music Day began in France, when musicians wanted a way to mark Summer Solistice, the longest day of the year. Thinking of no better way to spend the longest day than filling every moment with music, a global celebration was born. Members of Phi Mu Alpha participate in sing alongs on campus. 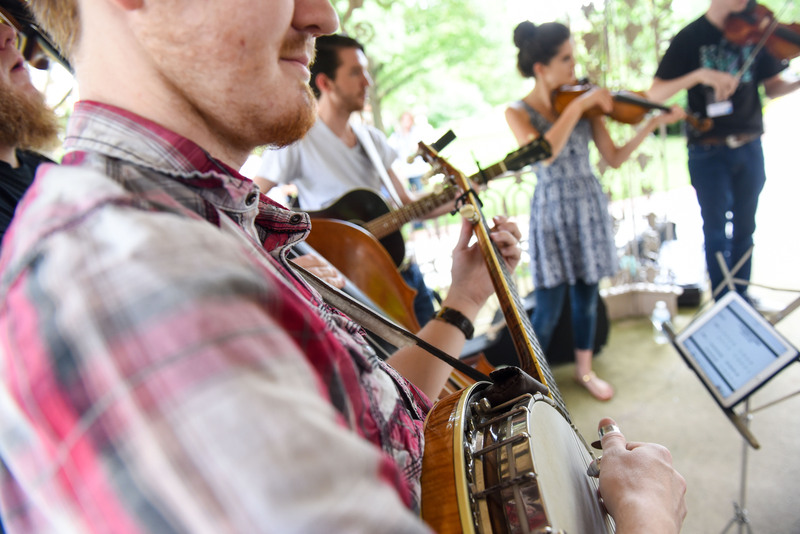 Make Music Nashville encouraged all corners of the city to get involved in the fun — from indie rock to bluegrass to a cappella, music students to professional artists. Seeking to “provide an equal platform for musicians of all skill levels, interests and walks of life,” the event exists to inspire the next generation of Nashville musicians through collaborative experiential opportunities. Belmont’s celebration began early Wednesday morning as songwriting majors visited two senior citizen homes — The Heritage in Brentwood and Green Hill’s Brookdale — to gain inspiration from a group who, as Songwriting Lecturer James Tealy put it, have lived a bit more life. After conducting interviews with some of the homes’ residents, the songwriters scattered across the city and got busy. Coming back together Wednesday evening, the students performed concerts at both locations where they shared their original pieces with an eager audience. Songwriting and music business double major Emily Falvey interviews a resident at Brookdale. Three veterans from Operation Song perform in front of 34 Music Square East. Festivities continued on campus all day as students, faculty and staff celebrated the day with jam sessions, concerts and more. Phi Mu Alpha, the music fraternity on campus, hosted Open Acapella Sings across campus all day, two faculty members organized an Open Bluegrass Jam where alumni and current students broke into small groups and jammed in circles and Music Row even got in on the fun. Ocean Way Nashville and 34 Music Square East hosted “Rush Hour” where singer songwriters performed for audiences to lighten the evening’s load. The event highlighted the work of many artists — including students and alumni — and featured students involved with Operation Song, an outlet for veterans to tell their stories through songwriting.